The Taco Bell Quesarito is a new configuration of the same ingredients, and it succeeds in improving on their old combinations. It won’t blow you away like the Doritos Locos Taco or the Cinnabon Delight (two of Taco Bell’s best innovations from the last few years), but in my opinion it is significantly better than Taco Bell’s similarly sized and priced burritos. 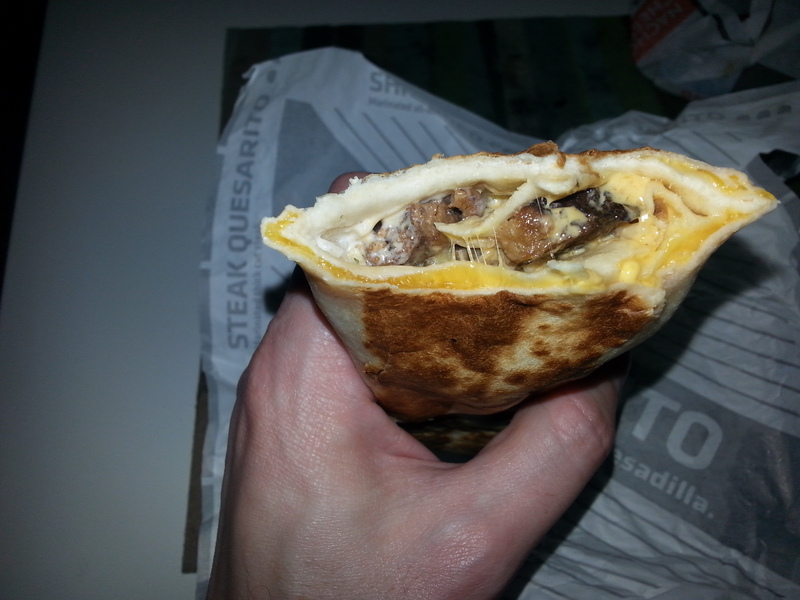 At my local Taco Bell, the Quesarito ranged from $1.99 to $2.99, depending on whether you got beef, chicken, or steak. (I chose the steak.) It was a lot smaller I expected, only marginally bigger than their Grillers. But it packs 650 calories into that small size, compared to 350-450 calories for the Grillers. What really makes it work is the cheese. They somehow managed to split the difference between semi-solid melted real cheese and liquid processed fake cheese, to come up with something that is deliciously gooey, but is held in place between the layers of tortilla. It’s a lot more cheese than is typically in one of their burritos, which is kind of the point. In terms of how it actually looked inside, there wasn’t a huge difference between the photo on their website and reality. (Other than the site photos is ground beef but I ordered the steak.) If anything, I’d say reality had the ingredients better mixed. Side note: Taco Bell stole the idea from Chipotle’s “secret” menu. I’ve never tried a Chipotle Quesarito. Regular Chipotle burritos are already too much food for me, and I typically only go there during the lunch rush when they wouldn’t be willing to make it. But I would be interested in a comparison, and to see how Chipotle’s unprocessed ingredients compare to Taco Bell’s more processed food. Then again, a Taco Bell Quesarito is 1/4 the price of Chipotle’s, so that’s something to consider. To sum up, I recommend the Taco Bell Quesarito, and will definitely get it again.